Image Size: 20"w x 27"h.
Rollin’ on the River… Two rocket-firing Bell UH-1 Iroquois helicopters weave in combat over South Vietnam’s hazy Mekong Delta, as if dancing to the rhythm of the classic lyrics made famous by Rock and Roll Hall of Fame singer Tina Turner. Better known as “Hueys,” these rotary-winged birds augmented existing aircraft in Vietnam in 1963 and, prior to the end of the conflict, they numbered 5,000. In great demand and used extensively, the Huey served in command-and-control, in medical evacuation, in the transportation of personnel and materiel, in air assault and as gunships. UH-1D Hueys carried 20mm cannon, rocket launchers, grenade launchers, up to six anti-tank missiles and could be armed with door guns. The UH-1Ds had a longer fuselage than previous models, increased rotor diameter, increased range, more powerful Lycoming engines, larger cargo doors and twin cabin windows on both sides. Lift was provided by two-bladed, semi-rigid, all metal main rotors and two-bladed, rigid, all metal tail rotors. 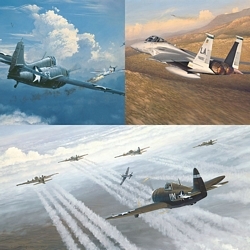 While serving in the U.S. Air Force, the artist, William S. Phillips, had opportunities to fly in Hueys out of Tan Son Nhut Air Base outside of Saigon, now Ho Chi Minh City.